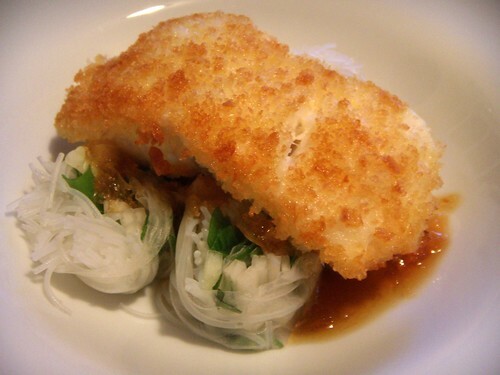 panko crusted local haddock over freshrolls with lemon and roasted garlic marmalade-style sauce, originally uploaded by aarn! +21st October, 2008+. took a walk down to the new deal fish market in east cambridge and picked up a pound or so of freshly cut fillets of local haddock. used a dry-wet-dry of white flour, egg, and then pankos, and pan-fried the crust of the fillets in hot canola oil until light brown, then drained some of the oil, flipped them over and cooked them the rest of the way in a 400-degree oven for a few minutes. made some spring rolls with sesame oil coated vermicelli rice sticks, julienne sliced green onions, daikon radish, and cucumber and thin sliced basil, then let them chill. reduced a mixture of ground lemon innards with about 30% rind with a few tablespoons of white wine, and a 1:1 ratio of sugar, until about 50% of the original amount of liquid remained, then once slightly cool, added mashed roasted cloves of garlic, stirred and put in a squeeze bottle to chill in the refrigerator. the haddock was served over a bed of crosswise cut freshrolls about 1-inch in length, which had been covered with the lemon and roasted garlic sauce. how about a seasonal butternut squash or spaghetti squash recipe?